DVD Slide show can make high-resolution photo album video CD from your photo collection using a CD burner. DVD Photo Slide show allows you to make use of your CD burner to create exciting photo slide show video CD with background music and you can share the slide show on home big screen TV with standard DVD or VCD player. With DVD Photo Slide show, thousands of pictures from holidays, landscapes, wedding or family parties can now be enjoyed on TV as high resolution slide show. DVD Photo Slide show makes it simple to create album from digital photo, picture and image, burn it on CD, and view it on TV in the comfort of your living room. DVD Photo Slide show gives photography lovers or photo collectors a new and easy way to view, store and share their pictures from digital camera, scanner or Internet. With just a few clicks, you can use DVD Photo Slide show to view and edit photo, create and organize your photo album, add background music, burn your photo album on blank CD-R or CD-RW disc. After that, you can show your creative works on TV through a DVD or VCD player. DVD Photo Slide Show can also archive your orginal photo files in CD so you can print or process them in the future. 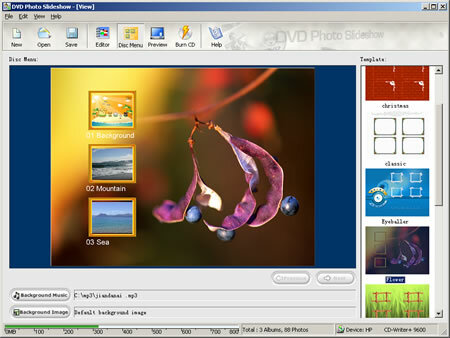 DVD Photo Slide Show is a unique photo to dvd software to help you turn your digital photos to video CD slide show. You can use DVD player to enjoy the exciting slide show on home big screen TV with your friends and family. This photo to dvd software uses VCD 2.0 still images to show your photo on TV, the screen resolution on TV is 704x576 and the photos quality on TV screen is very good. Support Background Music both for slideshow and disc menu. Support creating image (.cue file) file before burning CD. Support DVD or VCD Menu. Support DVD / VCD Preview. Internal music Mini-player for selecting desired background music. Very high image quality on TV, with a DVD player, the screen resolution of DVD slide show will be 704x576. Your photos will look great on TV. Well designed user interface. It 's easy to understand and you can create DVD Slide Show with 3 easy steps. DVD Photo Slide show supports the most popular graphic formats, including BMP, GIF, JPEG, JPG and TIF file formats etc. Save and organize your Photo, Picture and Image and Many pretty interactive menu template to choose from. It makes your DVD slide show outstanding and unique. Watch and share your digital photo on TV with DVD or VCD player. The original photo files can be save on the DVD slide show disc. It is a safe way to archive your photos and you can easily share your photo with your friends. DVD TO AVI AC3 Ripper - Rip DVD movie to AVI, AC3 support. DVD TO MP3 Ripper - Rip DVD Auido to MP3 WAV. DVD to AC3 Ripper - Rip DVD Audio to AC3. DVD to VCD SVCD MPEG AVI Ripper - Rip vob to mpeg avi vcd svcd. Easy Video Capture - Recording / capture screen activities into AVI. FotoDVD - DVD Photo Slide show - convert digital photos into DVD VCD MPEG files with hundreds of transition effects and audio. I photo DVD - Convert Photo to DVD VCD, create VCD DVD photo slide show and DVD Photo album with transitions and music! Hot ! honestech Photo DVD - Convert Photo to DVD, Anyone can create DVD from photos and pictures with Honestech Photo DVD ! Photo Show - Create a Photo Slide Show and Share Your Photos as Musical Slide shows and custom DVDs, Burn VCDs ! PointCapture - Find PowerPoint Slides and Build New Presentations as Quickly !